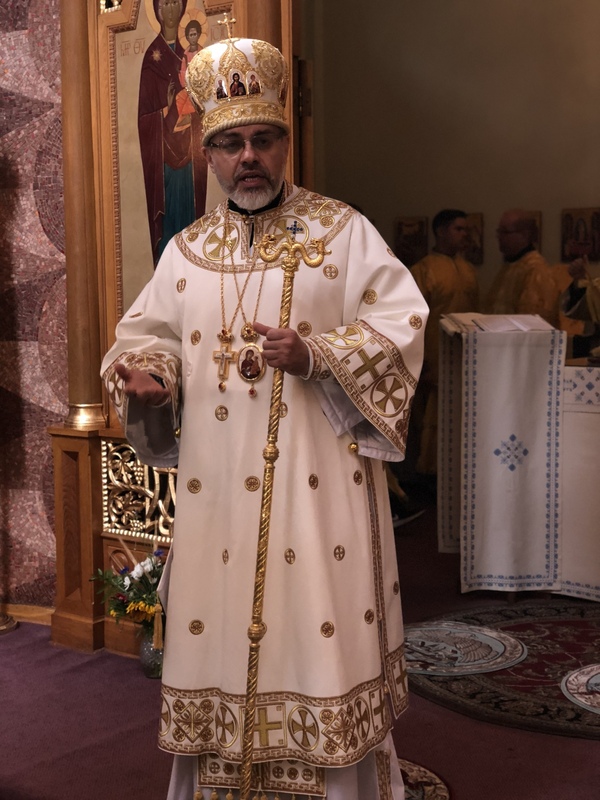 Following the festive celebration of 100 Years of Spiritual ministry of the Ukrainian Orthodox Church of the USA on the North American Continent, the clergy and faithful of the Church gathered at St. Andrew the First-Called Ukrainian Orthodox Memorial Church in South bound Brook, NJ in order to spiritually enter into a new century of ministry. St. Andrew Memorial Church - is a symbolic place… A place of prayer of generations of Ukrainian Orthodox Christians that due to political, economic and religious reasons fled Ukraine and found home in the United States of America. 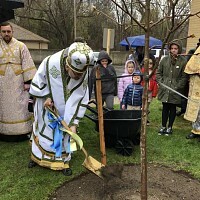 The Memorial Church is a place of a dream of generations of Ukrainian Orthodox Christians in the United States of America – to have a spiritual home – the very heart of spirit of Ukrainian Orthodoxy in a new world. 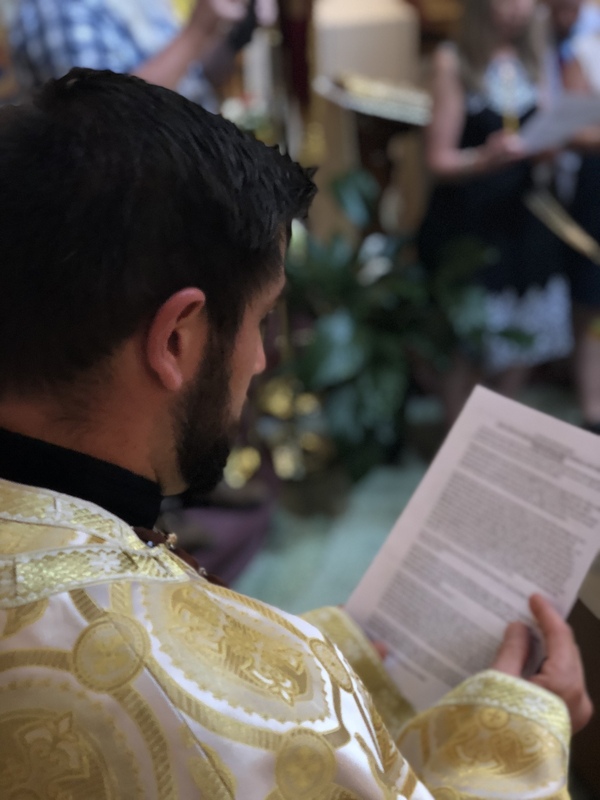 It is a church, at whose sacred altar, generations of hierarchs, priests and deacons have been ordained and consecrated for the service in the parish communities throughout Continental US and abroad. It is a home of a final rest of the metropolitan and fist patriarch of the Ukrainian Orthodox Church of the 20thcentury. It is place of prayer…. With prayer on their lips, hundreds of faithful of the Church awaited the arrival of His Eminence Archbishop Daniel to the threshold of St. Andrew Memorial Church in South Bound Brook, NJ. They youth, representing Jr. Ukrainian Orthodox League, welcomed their hierarch with the traditional greetings and flowers, while Mr. John Holowko, Senior UOL Executive UOL President welcomed His Eminence with the traditional bread and salt, calling upon the hierarch to pray for and to teach his spiritual children. Vladyka Daniel responded with the words of spiritual humility and tears in his eyes, reflecting upon the recent car accident of the spiritual father of the Church – Metropolitan Antony, who is hospitalized and was preparing to undergo a serious medical procedure. Moreover, responding to the words of welcome of Very Rev. Fr. 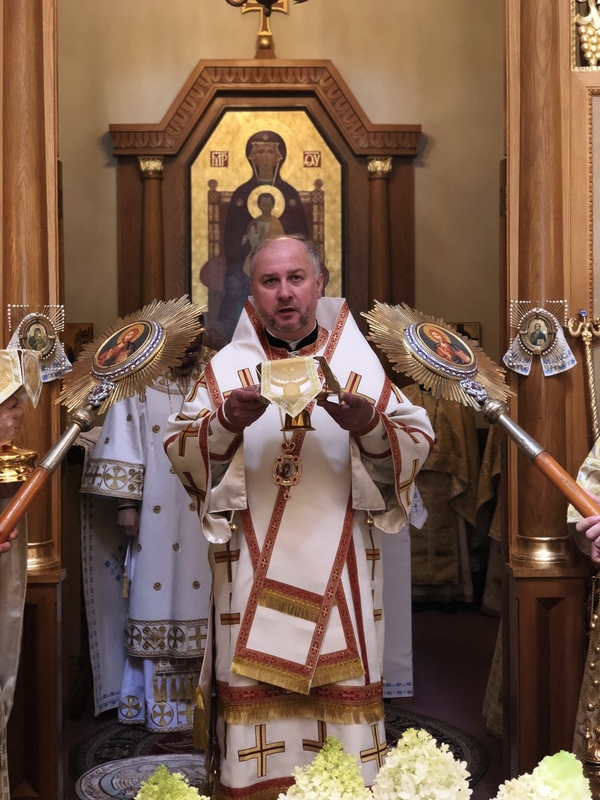 Yuriy Siwko, pastor of St. Andrew Memorial church, Archbishop Daniel mentioned the historical events of the weekend, reflecting upon the conclusion of the Centennial of Spiritual Ministry and the beginning of the new centennial with the very first Divine Liturgy served on this day – July 29, 2018. In addition, Vladyka stated that on this day the Church marks on her calendar the feast of the Fathers of the Six Ecumenical Councils, as well as the commemoration of the 82ndbirthday of Metropolitan Constantine of blessed memory. 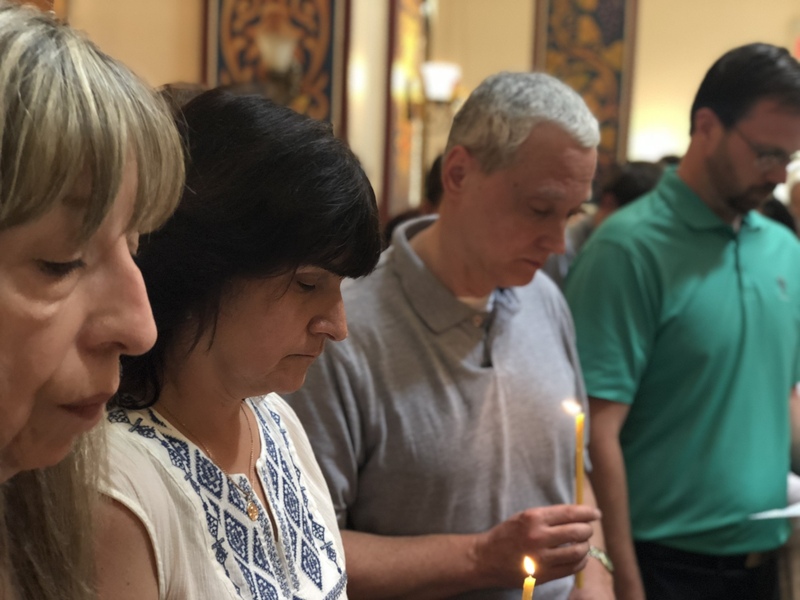 As Archbishop Daniel entered the Church, the choir of St. Andrew Memorial Church prayerfully began to chant under the leadership of Dr. Michael Andrec and with the participation of visiting singers from the parishes of the UOC of the USA. 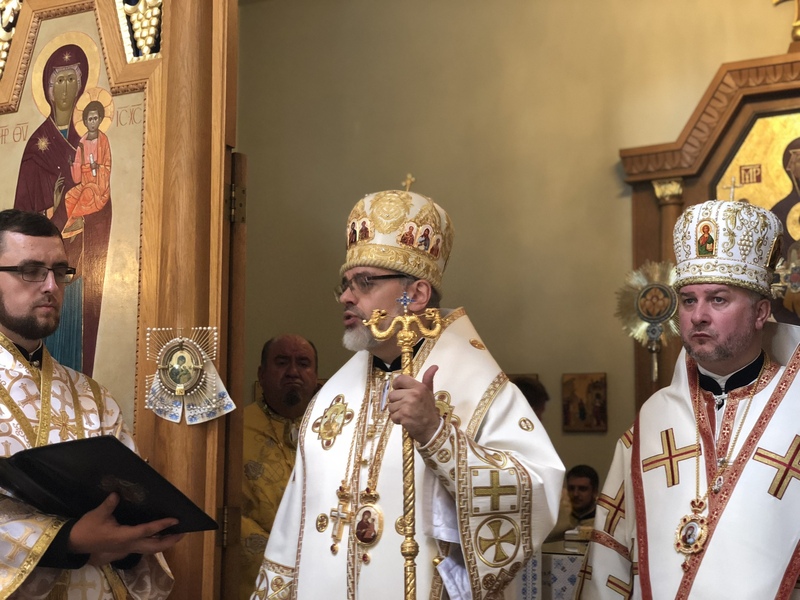 Following the vesting of His Eminence, His Grace Bishop Andriy of the Ukrainian Orthodox Church of Canada, joined Archbishop Daniel for the celebration of the Divine Liturgy. Fifteen priest and three deacons concelebrated. 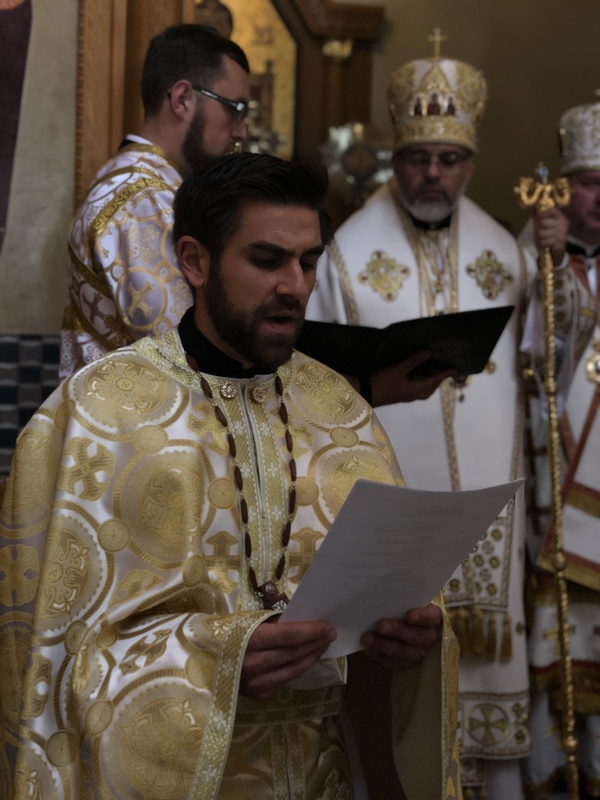 The seminarians of St. Sophia Ukrainian Orthodox Theological Seminary surrounded their bishop and truly faithfully and prayerfully assisted with the celebration of the Divine Liturgy of a New Centennial. 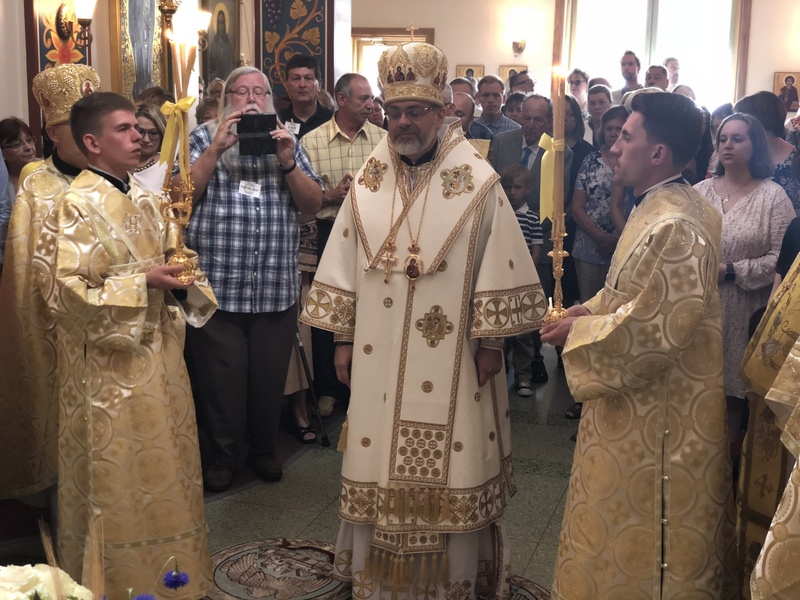 In his sermon, Archbishop Daniel called upon the faithful to concentrate on their spiritual journey, raising the next generation of spiritually and morally solid Ukrainian Orthodox Christians and citizens of the 21stcentury. Vladyka asked the faithful to look at their personal journey of life and to re-examine the values and notions by which they live. Reflection on the Sunday’s Gospel narrative, Archbishop stated: “…The boat on the sea is one of the earliest Christian symbols for the church in its journey through the world. Just as the boat is tossed about by the waves so is the church pounded from all sides by worldly and spiritual forces hostile to its message: the kingdom of God.In the midst of crises Jesus comes to restore peace and harmony in his church. But he comes in a form and manner in which he is easily mistaken for the enemy. He comes in a way that makes many well-meaning Christians cry out in fear "It is a ghost!" as they try to keep him out. But if we listen carefully we shall hear through the storm his "still, small voice" whispering in the wind, "It is I; do not be afraid"(Matthew 14:27). If we believe on his word and take him on board the storm immediately subsides and the crisis is resolved…. At the Great and Holy Entrance, Archbishop Daniel commemorated the ailing metropolitan Antony and the hierarchs of the Permanent Conference of the Ukrainian Orthodox Bishops Beyond the Borders of Ukraine: His Eminence Metropolitan Yuriy of the UOC of Canada, who was in attendance of the Liturgy, His Eminence Archbishop Jeremiah of the UOC Eparchy is South America, His Grace Bishop Ilarion and His Grace Bishop Andriy of the UOC of Canada, as well as two retired hierarchs: Metropolitan John of the UOC of Canada and Archbishop Ioan of Western Europe. Hundreds of faithful with children in their arms approached the Holy Chalice in order to receive the Most Holy Eucharist – the True Body and Blood of Christ the Savior, the One who offered Himself as a Sacrifice and calls upon us to share in His Life and Ministry. 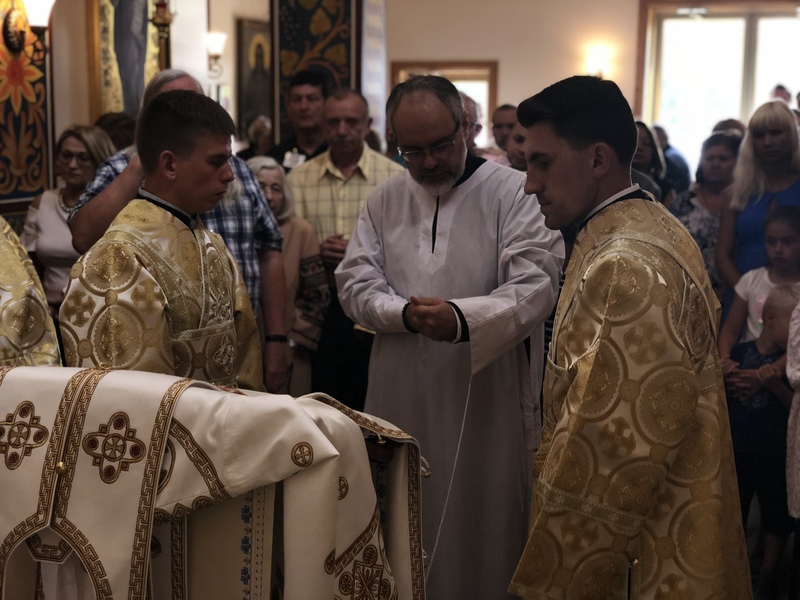 At the conclusion of the Divine Liturgy, Rev. Fr. 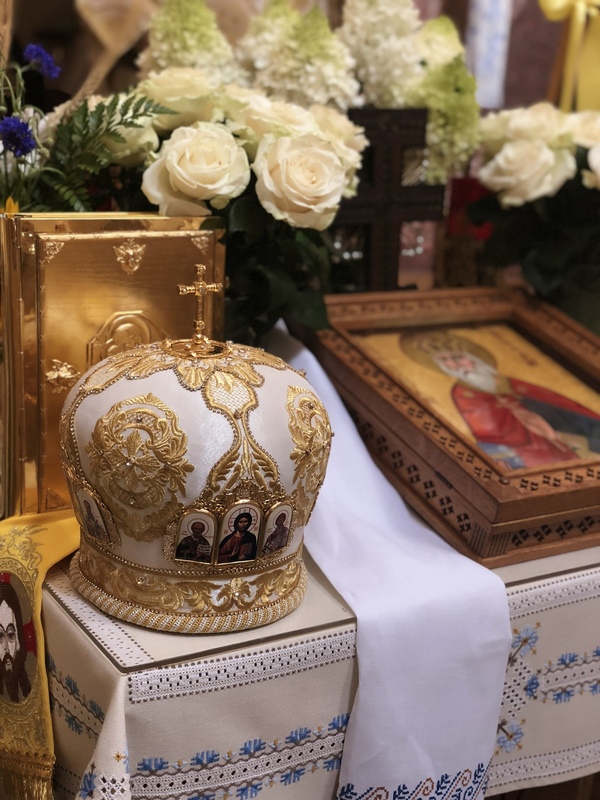 John Charest presented to His Eminence Archbishop Daniel with the newly elected Executive Boards of both Senior and Junior Ukrainian Orthodox League. 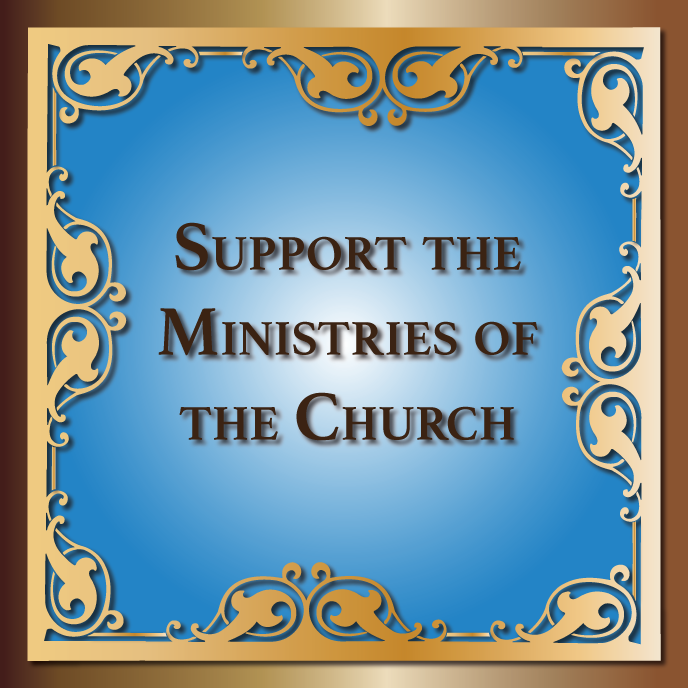 Vladyka administered the Oath of Office to the board members and called upon them to faithfully execute the ministry to which they were called by God and His people. 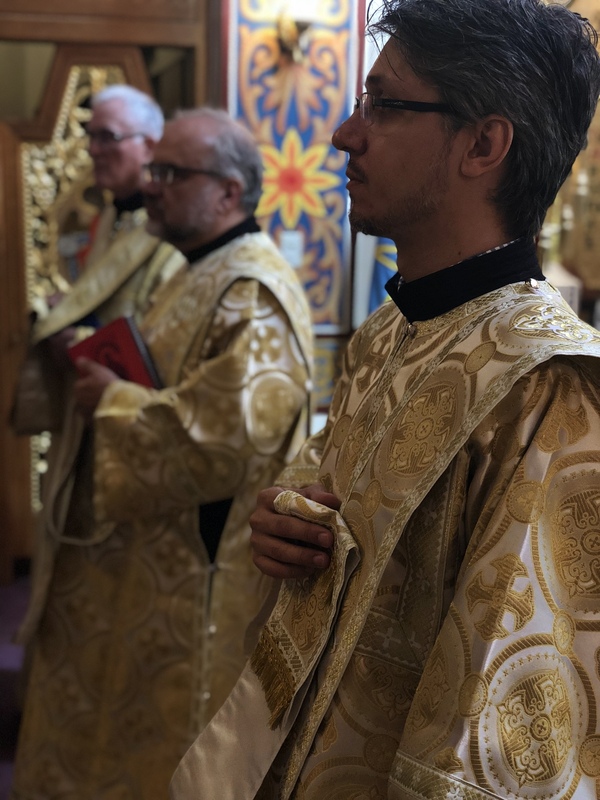 Following the Divine Liturgy, Archbishop Daniel addressed the visiting clergy from Australia, Great Britain, Canada, Belgium, France, offering the words of hospitality and gratitude for their participation in the Centennial Celebration of the UOC of the USA. 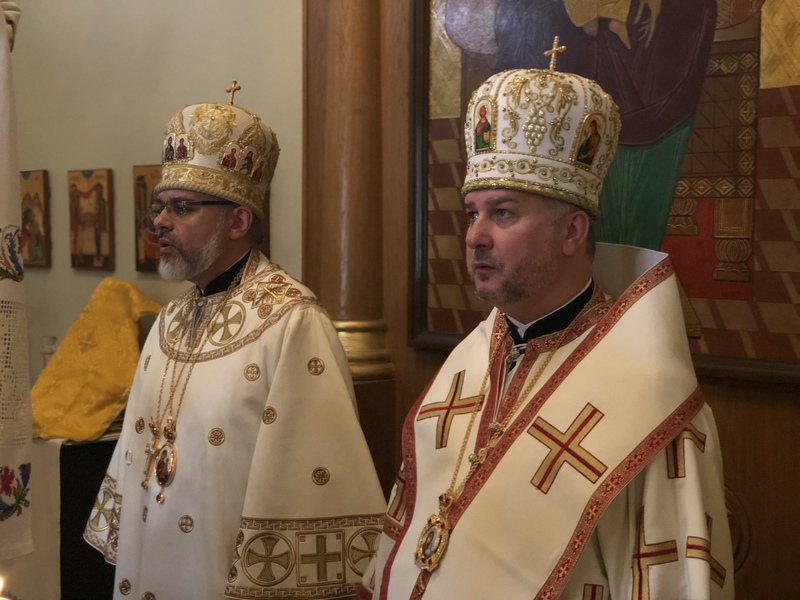 His Eminence expressed profound words of gratitude to the hierarchs of the Ukrainian Orthodox Church of Canada and Very Rev. Fr. 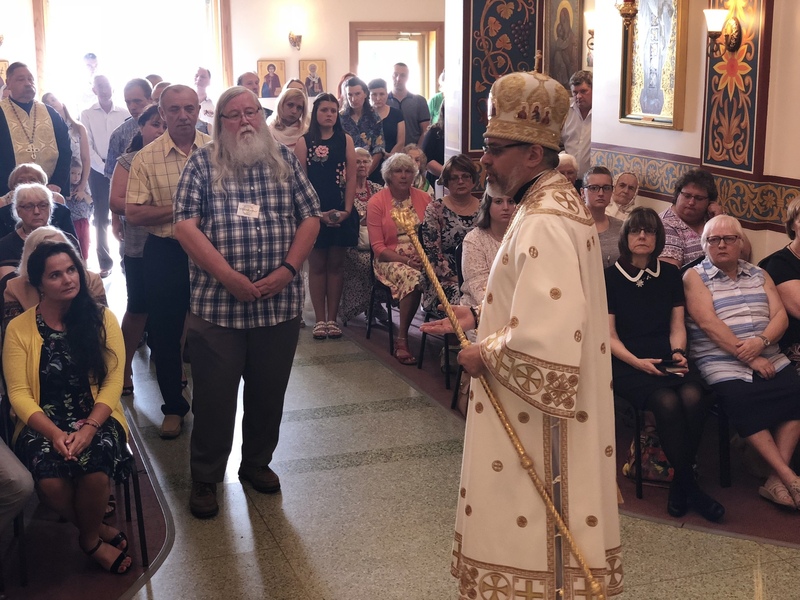 Tars Udod for their support and the gift of compassionate leadership in the time of illness of His Eminence Metropolitan Antony, who was not able to be at the Centennial Celebration due to a car accident and Metropolitan Yuriy assumed the leadership at the Eucharistic Divine Liturgy. 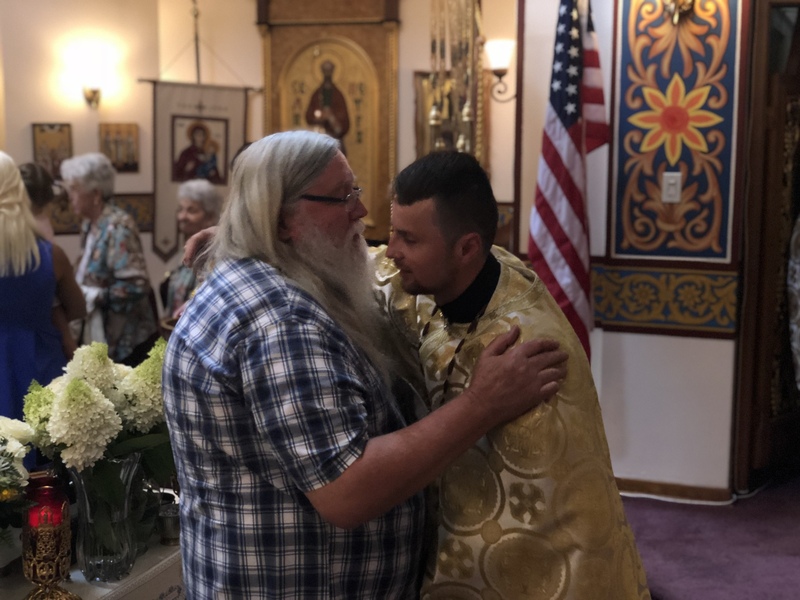 At the very end of all formal remarks, Vladyka Daniel introduced to everyone in attendance the youngest priest of the Ukrainian Orthodox Church of the USA – Rev. 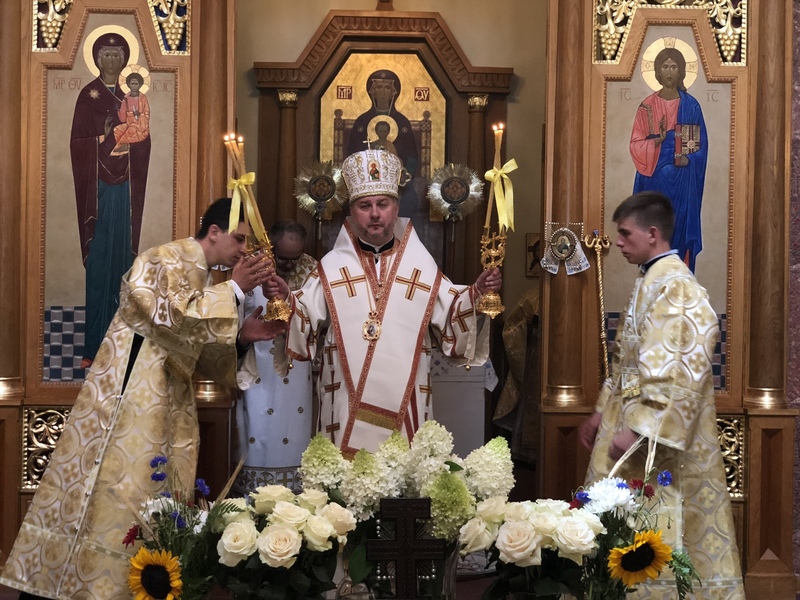 Fr, Volodymyr Yavorsky, who in a few short hours following the Liturgy, was departing to assume pastoral responsibility of his very first flock – the Ukrainian Orthodox parish of St. John the Baptist in Portland, OR. The archbishop simply instructed Fr. 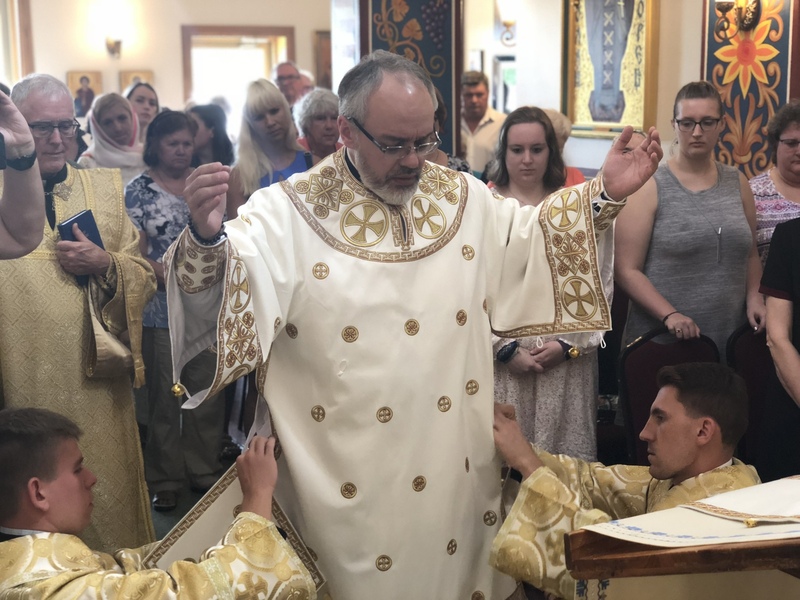 Volodymyr to assume the pastoral responsibility with love, compassion and pastoral zeal. Joyful “God grant you Many Years!’ was chanted by choir members as Fr. 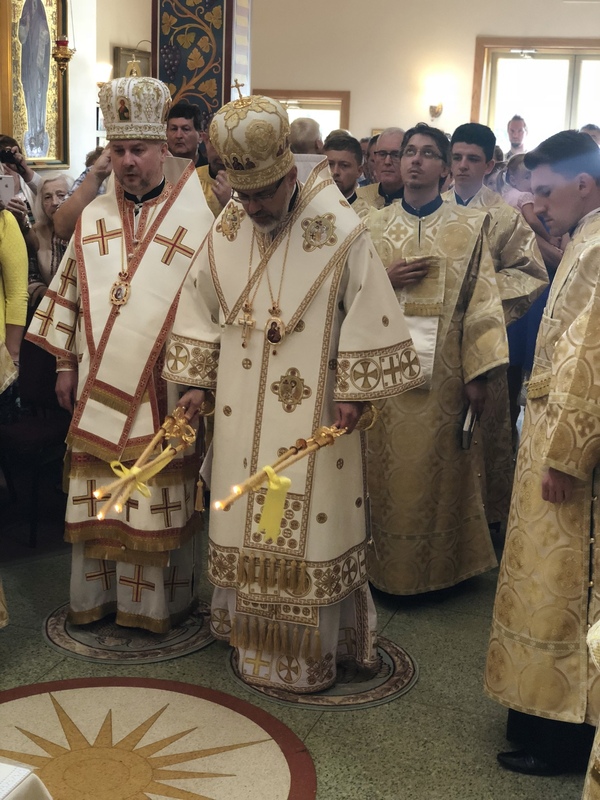 Volodymyr Yavorsky presented a cross for veneration and bid farewell to his brothers in the Holy Priesthood, seminarians with whom he studied for the past 5 years and the entire community of St. Andrew the First-Called Apostle Ukrainian Orthodox Memorial Church at the Metropolia Center of the UOC of the USA in South Bound Brook, NJ. The day concluded with a final farewell luncheon in honor of the delegates of the 71stAnnual UOL Convention. The 2019 UOL Convention is scheduled to take place At All Saints Ukrainian Orthodox Camp in Emlenton, PA.